This recipe comes to you from Erin Carlson. Erin and her husband Erik (Chuckie) hosted our annual New Year’s Eve Olympics this past year. It’s a weekend where we play a bunch of boardgames and eat lots of food. This particular recipe came out of that weekend. It was delicious and appeared to be an easy dish to make, but that’s easy for me to say as I was only the taster. Good stuff, thanks Erin! In microwave, combine onion, pepper and water. Cover and cook 2-4 minutes on high until crisp-tender. Drain well. Unroll pizza crust onto greased 14 x 10″ pan. Spread with salsa. 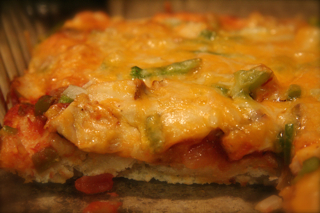 Top with chicken, onions, peppers and cheese. Sprinkle with garlic. Bake 400 degrees for 15-20 minutes.